As Cybertron Turns: A free Transformers toy web comic strip starring Optimus Prime and his Ebay-Acquired Autobots! As Cybertron Turns Discussion Forum. EP 03 Enter The Fred! Attack of The Not-Even-Close-To-Being-A Unicron Wanna-Be! EP 32 Will The Real Prime Please Stand Up? EP 40 The Matrix Holder Revealed! EP 78 "To Serve Rice Krispies Treats"
EP 94 Man of Action! EP 100 (A Less Than) Deadly Genesis! EP 103 Be Our Guest! This comic features toys that include, but are not limited to, properties of Hasbro, Takara, Bandai, Kenner, and Mattel. 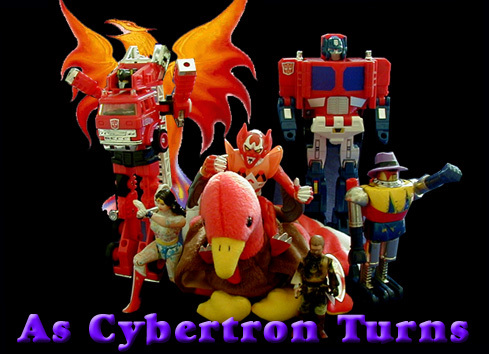 As Cybertron Turns does not claim to own the rights to these toys, nor does it seek to profit from their usage. All donations are used to pay for the maintenance of this site. To contact me regarding any further concerns, please click here.